Last year, I waited until the very last minute to decide that I wanted to make a Halloween costume for my daughter. Of course, my last minute project didn’t go so well. I won’t get into all the details, but lets just say that my attempt to make fairy wings was a fail. Tinkerbell would NOT have been proud. So this year, I decided early that I was determined to make a costume for my daughter. She initially wanted to be Minnie Mouse — an homage to our Make a Wish trip to Disney this summer — but I knew I had little chance of being able to make Minnie’s dress, given my less than stellar sewing skills. I searched hundreds of homemade costume ideas, but couldn’t decide on one both my daughter and I liked that I’d actually be able to make. Until I downloaded a background photo of a peacock to my iPhone. Inspiration! I don’t know what made me think I could make a peacock, but I went ahead with the idea anyway. Pinterest and Coolest-Homemade-Costumes.com provided enough ideas for me to start sketching what the costume would look like and making a list of necessary supplies. I won’t lie: I really splurged on the feathers for this costume. Before the feathers, I had spent about $25 for the other supplies. I wound up spending an additional $50 on feathers alone — and I would’ve spent more if I hadn’t gone to go to Hobby Lobby on a day when they happened to be 50% off. 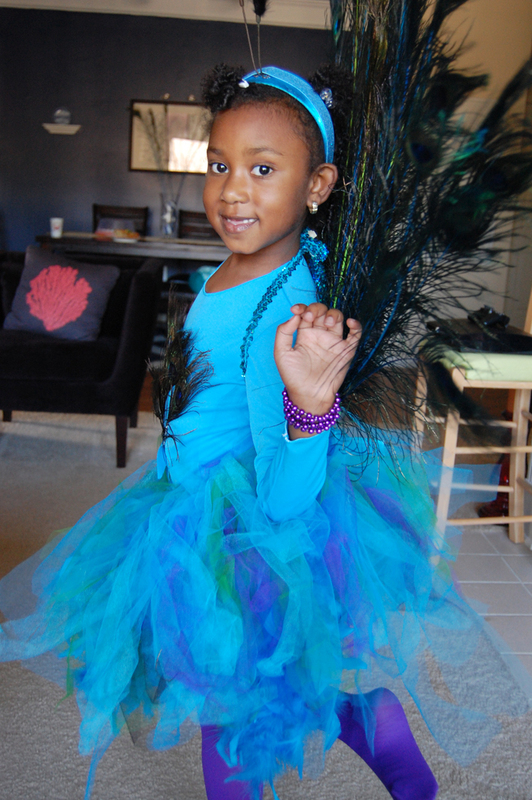 But I was determined to make this costume with real feathers and not with fabric. And I think it was totally worth it in the end! Of course, once I bought the feathers, I still had no idea how I was going to turn them into a peacock tail, much less attach it to my daughter’s back. So I improvised. I held a piece of a cardboard box up to my daughter’s back so I could get an idea of the size I’d need. I drew a wedge shape approximately the width of her back (at the widest point) and cut it out. Next, I made 2 vertical cuts in the middle of the cardboard. I threaded the elastic sequin trim through the slot, planning to use it to make either a belt or arm straps. I glued the trim to the cardboard where it came out of the slots to make it extra secure. 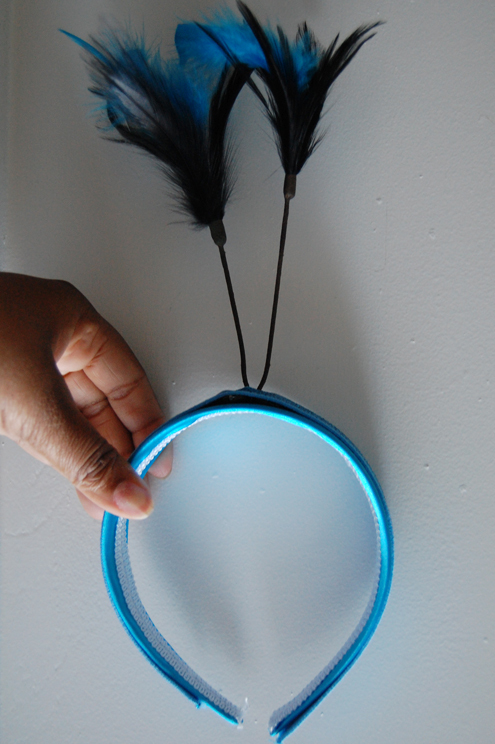 Next, I simply started hot gluing the feathers to the cardboard in a fan pattern. 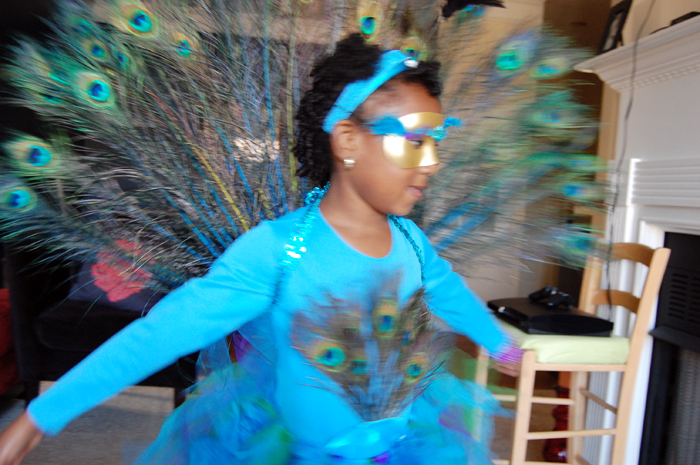 It is worth mentioning that the “eyes” of the feathers (the pretty circle part at the top of the feathers that make peacocks so recognizable) need to face forward, toward your child’s back. This way, they’ll be seen from the front when they’re wearing the tail (see the front view above). 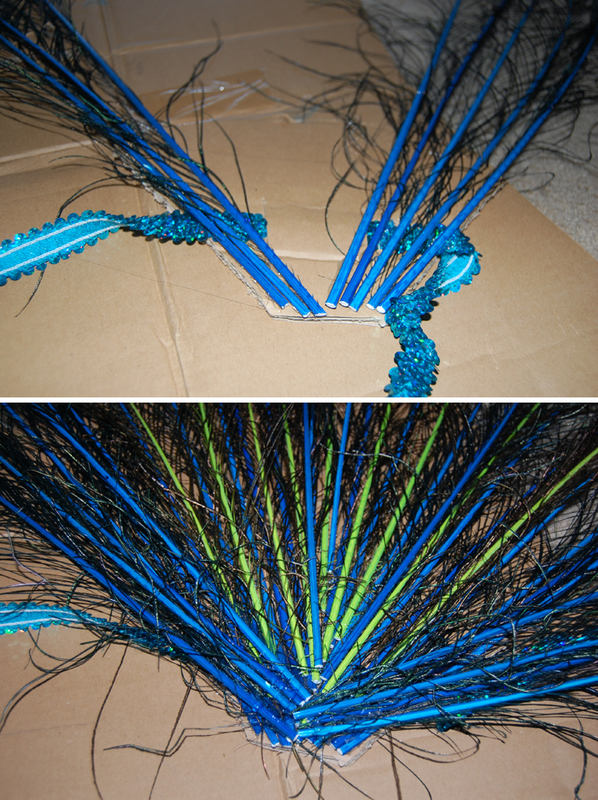 I had to cut down some of the feather stalks since the feather lengths varied, but they were really easy to cut. I started gluing at the outside edges and worked my way to the middle, leaving a little space between each stalk. Once I had one layer, I started working to fill in the spaces between the first layer, to better fill out the fan. The feathers were secure, but I needed a way to cover up the jumble of stalks, since all of this would be visible from the back. I cut a piece of an old folder in the same fan shape, and glued it on top of the stalks to cover them up. Lastly, I cut some blue and green fabric into “scale” shapes, and layered them on top of the folder — first a row of green, then a row of blue. I overlapped each “scale” to make sure the folder wouldn’t show between them. 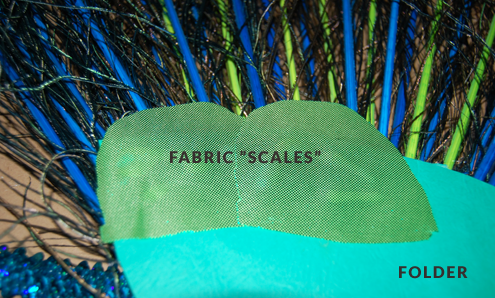 You can see in the first photo of the finished tail how the “scales” worked once they were complete. 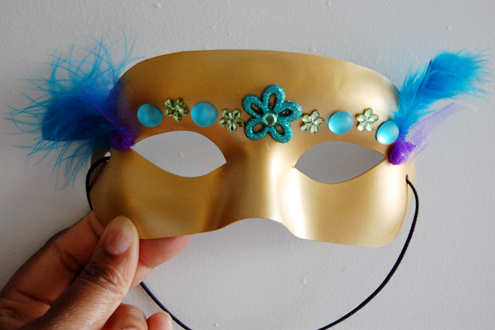 I picked up a gold, plastic, masquerade-style mask on a whim, thinking it would be a great addition to the costume. I was right. I simply hot glued some beaded embellishments onto the mask. They are designed for flip flops, but they worked just fine for the mask. I had some scraps of tulle and feathers left over from the tutu, so I added a little around the edges to give the mask a little something extra. 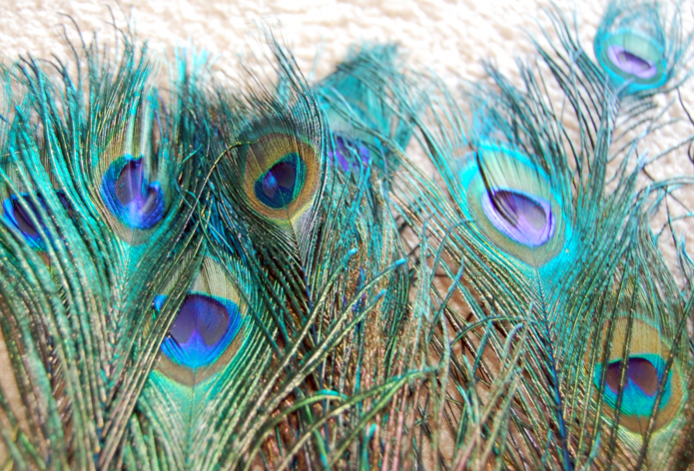 One of my favorite parts of a peacock (in addition to their beautiful tails, of course), are the feathers on their heads. I found peacock head plumage feathers online, but I didn’t want to wait for them to be shipped, so I figured I’d try to replicate them on my own. I bought a couple of stalks of black feathers from Hobby Lobby. They looked like tiny feather dusters at the end of a solid, but flexible wire. I knew the wires would be too long, so I bent them at the length I wanted (about 4 inches). Next, I measured an additional 3″ and cut off the rest of the wire. I bent that additional 3″ section back on itself several times to create a makeshift base that I could hot glue to a headband. 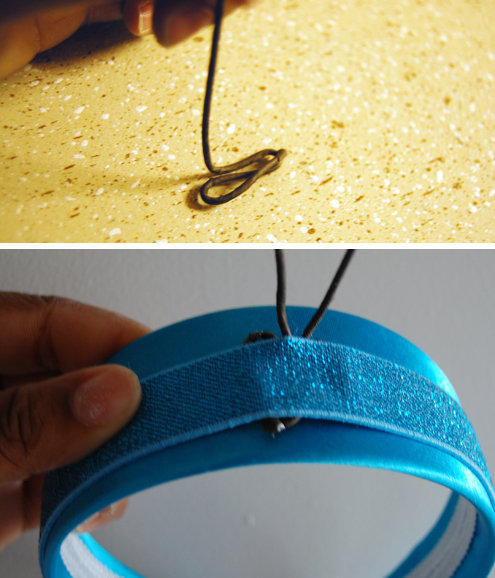 The headband needs to be hard (not flexible) and relatively wide for this method to work. But though it worked, but it wasn’t pretty. I had to improvise again. 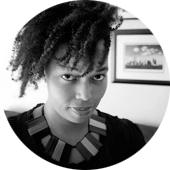 I used a flexible headband in the same color, also relatively wide, to cover up my handiwork. I cut the flexible headband open and glued it across the full length of the hard headband to cover the base of the feathers. Finally, I grabbed some more leftover feathers from the boa used in the tutu and hot glued them in the center of the black feathers. Done! 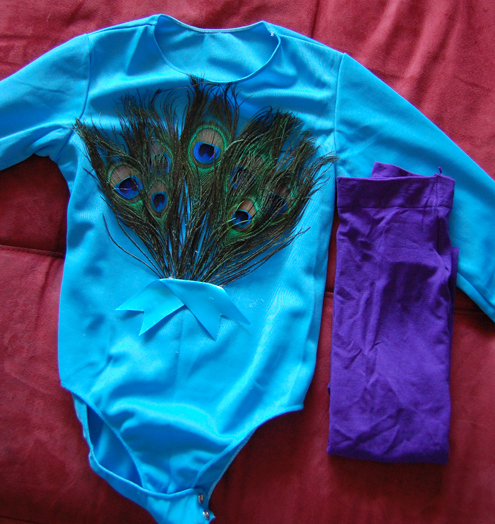 Ja’Naya would have to wear something under all these pieces, and I initially wanted her to wear a blue unitard. Those were all but impossible to find locally though, so I decided on a leotard and tights. I bought a sleeveless, crushed velvet leotard from Walmart’s Halloween section, but I had to return it. It was really ill-fitting, especially in the underarm area, and I thought it would be a good idea to find an option with sleeves in case it’s really cold on Halloween. So I headed to Target and found a long-sleeved leotard in their Halloween section. I initially planned to leave the turquoise leotard plain, but once I saw it all together, I knew the bodice would need some embellishment. I grabbed a couple of short peacock feathers from JoAnn and hot-glued them to the front of the leotard in a fan pattern. Then I cut a strip of ribbon to cover the bottom of the stalks. I couldn’t wait to see all the pieces together, and I know my daughter was equally excited. So are you ready for the final reveal? Here she is, my little peacock! As I saw each piece of the costume come together, I knew the total package would be awesome, but I couldn’t anticipate how beautiful it would all be! We are both incredibly happy with the way it all turned out. After Halloween, the peacock fan will find a permanent spot on the wall in her room. So now I have to figure out how to outdo myself next year. And what shoes she’s going to wear. On both counts, I have no idea. So what about you? Have you ever made a homemade Halloween costume? Are you planning to make any this year? I’d love to hear about it in the comments below. Looking for more DIY costume ideas? Disclosure: I am a member of the Walmart Moms program. Walmart has provided me with compensation for sharing my DIY Halloween costume project with you. Participation is voluntary and as usual, all opinions are my own. WOW. This is so impressive, and she looks gorgeous! The gold on the mask is just beautiful against her skin. I really hate dressing up, but I love seeing little kids enjoying all the fun. I love this costume! I love dressing up and making costumes, and this is so unique and so pretty! You did an incredible job Jennae! She looks fantastic. Everything came together perfectly. She’s going to wow whomever she sees on Halloween. Congratulations! I’m in Denver with our new grandgirl (8 says old) and turned out a quick burrito “costume” for her which I’ll have up on the blog tomorrow in honor of National Costume Swap Day. She looks cute but I sure didn’t put in anywhere close to the amount of work you did. Will tweet this one for all to see! Jennea your daughter looks Adorable and Amazing! Go ahead and dress up for her, because she’s only little for a while! Enjoy your times with Halloween costumes and dressing up together will always be a memory that she’ll never forget! My children haven’t forgotten my time spent with them, best times of Fun n Laughter! So Make Her Dreams Come True Mommy! You’ll Never Regret Them Times Spent! Whoa! Awesome job! She looks BEAUTIFUL! What an adorable costume! And you can tell she loves it! That brilliant blue looks lovely on her. Thanks Michael! She’s really happy with it, and she would probably wear it every day if I let her 🙂 Plus, now that she knows I can make a tutu, she’s already asked me to make a few more in other colors! Beautiful costume and it looks great on your little girl. She must feel wonderful wearing it. It’s amazing what you do with your imagination. Keep it up! OMGoodness!! It is absolutely beautiful. I am making my daughter’s SuperHero Costume. I will post pics when I am done! Thank you! I’ll be eagerly awaiting the superhero pics! This handmade costume thing is making me more excited about Halloween than I’ve been in a long time! Beautiful job! She looks like a Barbie doll. Very nice. Thanks, but you get a serious side eye for that. Me, in a leotard and tights, in public? Ummmm….no. Lmao! Oh my goodness! This is fabulous. My daughter asked to be a peacock this year and I made her choose something a little less ambitious. Slacker mom. I love it! Awww! Thanks Amy! Ambitious or not, I know whatever you make for your daughter will be awesome! I can’t wait to see the result! Jennae- this looks AMAZING! Great job. Your daughter looks beautiful as a peacock! This costume looks amazing!!! I’m going to show it to my daughter and see if she’d like this too. I still have one kiddo without the costume! You did an amazing job!! My daughter came up with the idea to be a peacock a few months ago. I’ve been looking all over for ideas on how to do the feathers, I couldn’t find anything! I was going to use styrofoam and then stick the feathers in, today I found your’s on pinterest and knew this would be much better! 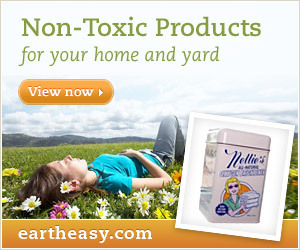 Thank you so much for sharing how you did it! Jennae, I struggled to make peacock wings for my daughters costume until I saw this. I hope I can get my daughter’s wings to stand up like yours and not flop down as my homemade wings did last year! Your daughter is BEAUTIFUL in her peacock costume. Thanks for sharing! OH Wow! That was a great costume. I love the tutu idea. I am gonna show it to my girls and see if they want to do a project for theirs. Your little girl looks very familiar. Do you live in Atlanta? I’m a grandma now and have made homemade costumes for my kids then my grandkids for about 40 years. Two of my favorites were: a horse rider – saddle and horses legs draped around my 5-year old granddaughters waist (held up by shoulder straps); then when she had a little brother I made Little Bo Peep and her little lost sheep. Its so fun and when my Ema said she loved peacock feathers and I saw your design I knew I had to do it. At first I thought I would have to figure out how to make it until I dug a little deeper and found your instructions! Wow! Wow! This will be the best ever. You’re great! Thanks! Sally, I’ve made a costume — or at least a portion of it — for my daughter for the last three years, and I’ve come to really look forward to it 🙂 I’m glad I could help you make something special for your Ema! I LOVE this costume! 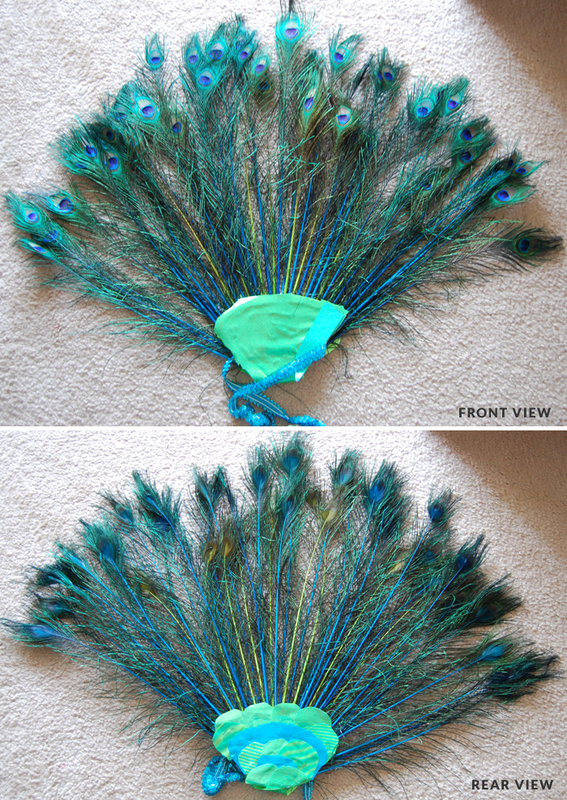 We just got most of the pieces for my 10-year-old’s peacock costume this weekend, but after seeing this, I am going to have to find real feathers to add to it. Yours is very cool! Jennae this is absolutely amazing. I know she enjoyed wearing your creation. Great quality and very artistic. Love it. Hi there! You just saved my life! My 4 year old is asking to be a peacock for Halloween and this hits it out of the park. I just had one quick question for you. How many feathers do you think you used? I’m going to have buy them via eBay since I can’t track them down locally. Wish I had a daughter to make one for. This was awesome. You are so creative. I loved this costume and it looks beautiful on your daughter. I too am making a peacock costume for my daughter this year, which is how I found your blog. Thank you for your post, it was so helpful. I used some of your tips to work out problems with my own creation. I can’t wait to see how it all turns out. Can you give me some pointers on the arm straps/belt for the elastic? Trying to come up with a way to make this work 🙂 Its so beautifuL! I know I’m about a year late on commenting, but I just found your site while looking for a teal leotard for my daughter. What a beautiful costume! You are so talented! 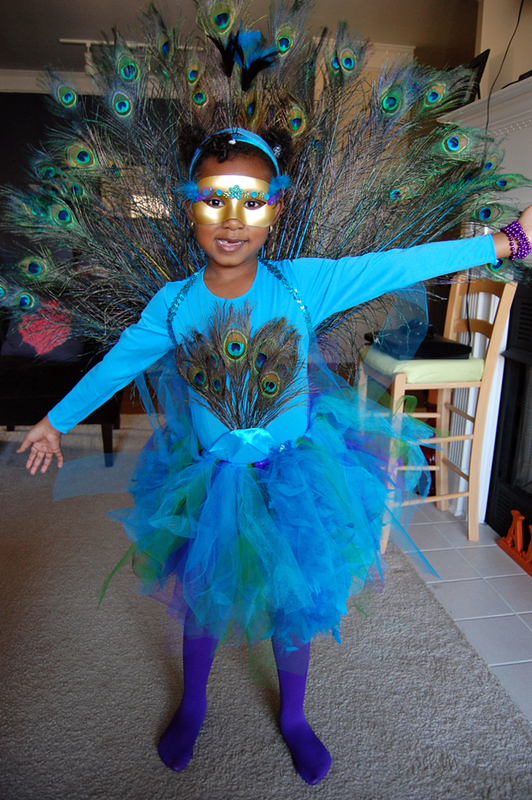 I was looking for a diy peacock custume design for my kid- and i was more then happy to find yours. it is so creative, amazing, and looks like million dollars. YOU’re AMAZING!!!! This is sooooo fabulous!!!! I love your peacock costume and am making one for my daughter following your instructions. I should mention that I am not crafty nor do I sew. So far it hasn’t been too difficult for me. I do have a question about how you attached the tail feather to your daughter using the elastic. Can you help with this? I am going to make this. My daughter wants to be a rainbow peacock ( she’s obsessed with rainbows). How did you make the straps for the tail? 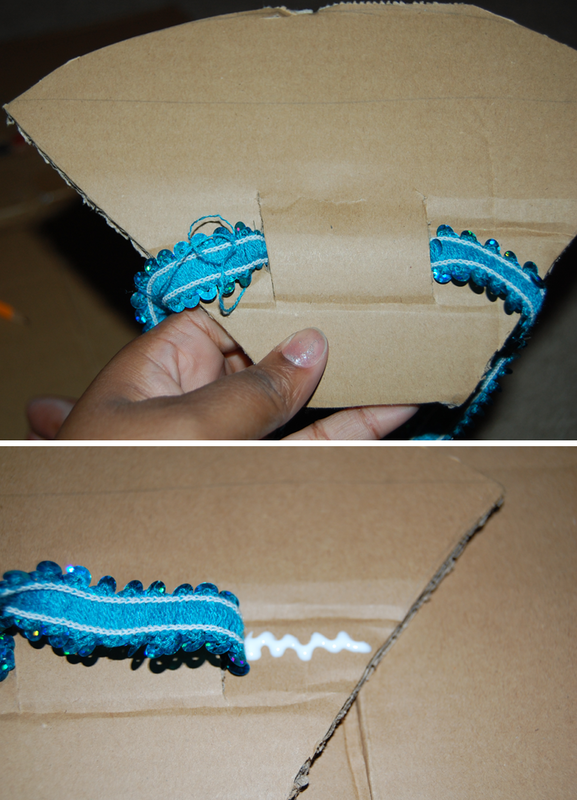 I understand how you threaded and glued the elastic ribbon through the cardboard, but how did you make the loops for the arms? I’m not Crafty, my apologies for needing more instruction. Seriously WOW! This is impressive! Next post: Seventh Gen Products AND Free Shipping? I Love It! Previous post: Feeding the Birds, Halloween style!